bluecode320 is one of the worst types of YouTuber. He likes to harass children and just generally be a troll about American politics. The worst part about it is that he isn't an American, he's from the United Kingdom, and he's a loser. Read his sidebar, he's too stupid to even get Movie Maker going but he wants to tell the whole world what their problems are and how to fix them. Most recently he's been harassing republicanteenboy, a 12 year old boy who happens to be proud he's a Republican, for a few weeks now. Apparently some people in the UK don't believe that people have any choice in their political leanings. bluecode320 sent me a long diatribe that reminded me of the Unabomber's manifesto. I guess he doesn't get any attention, and he probably still lives with his 'mum'. Anybody that sends out long, drawn out political rants to people he doesn't know must be on some kind of medication. Maybe after he solves the worlds problems he can get Movie Maker going and make a video about how he solved the worlds problems. If his mother keeps paying for internet, that is. 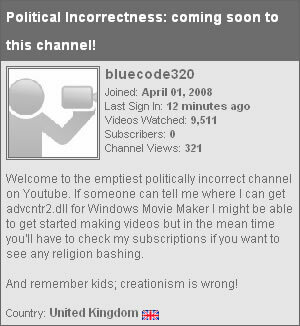 bluecode320 fits the profile for a British Obama supporter, trolling Republican videos and terrorizing children to make himself feel like he's a man. Obama attracts trash like bluecode by the thousands. British and Canadians drive by my videos all the time bashing me for not liking Barack Obama. Why don't they worry about electing their next Queen? Oh, wait, they have no say in who is their King and Queen. Maybe that's why they are such losers, they feel helpless. If you have to terrorize a child to get your point across, then you have no point, you're just a coward and manipulator. And, in bluecode320's case, his opinion doesn't even count because he cannot vote in our elections. Which makes him a typical foreign Barack Obama supporter, a hateful and stupid loser troll who has no problem picking on children. We have plenty of those here already.